The housing market is always in flux. It seems like from month to month, there are radical changes that make it a buyer’s market one minute, and a seller’s market the next. And while we at The Mortgage House, LLC can’t predict what 2018 will bring to the housing market, we’ve assembled a list of five foolproof tips to add value to your home. As your preferred mortgage broker in Fayetteville, we’re here to help you with all of your home buying needs. Whether you’re looking for a loan to help you buy your first home, or build it, The Mortgage House, LLC is ready to leverage its resources to help you. If you’re thinking of selling your home or are simply looking for ways to increase its value, working with a certified home inspector is a great place to start. Home inspectors do a thorough walk-through of your home to look for areas and items that could be improved to increase the value of your home. Often times, the inspection is rigorously documented as the inspector does a visual inspection of your home, as well as conducting an operational test of its systems and appliances. It’s important to have an inspector visit your home before you put it on the market. It would be a frustrating experience to have a contract on the table, only to have the buyer’s home inspector let you know about the mold they found growing behind your bathroom tile. Having a home inspector go through your home beforehand allows you to address problems like these before you sell the home, making your experience easier. It’s also good to have regular home inspections conducted even if you aren’t selling your home soon. When you do sell your home, having a well-documented series of inspections tells your prospective buyer that you have a history of maintaining your home, and allows you to address any issues the inspector notices in a timely manner. This might seem like a silly thing to invest in. After all, it’s the bathroom, no one spends that much time in there, do they? You’d be surprised. On average, a person spends about an hour-and-a-half each week in the bathroom, which adds up to an incredible 92 days over the course of their lifetime. While that still doesn’t mean your bathroom sees as much use as your living room, it’s still a wise investment to upgrade your bathroom. These upgrades can be as simple as replacing your old-wooden toilet lid with a modern slow-lowering toilet seat. An easy upgrade like that prevents that awkward banging noise when you accidentally drop the seat at 2:00 AM. Of course, you can also go more in-depth with your upgrades. Many homes have begun replacing older tile or laminate bathroom countertops with stylish granite or marble countertops with basins already carved in. You might consider replacing the overhead lighting with wall mounted lights that add a warm light to the space. And for the ultimate in luxury bathroom upgrades, you might consider adding heated floors, they make getting out of a nice warm shower that much easier. For most real estate and housing experts, the kitchen is the number one room that sees a return on investment when it’s upgraded. Like the bathroom, many people spend a lot of time in the kitchen, whether they’re cooking, eating or just socializing. As a result, upgrading your kitchen makes an already inviting space even more welcoming. We suggest that at a minimum, you take the time to put a new coat of paint up in your kitchen. This will freshen up the space immensely. If you’re feeling more ambitious, tackle the backsplash behind the sink, and add new tile or stonework. Replace your appliances that are in that old beige color with more sleek stainless steel options. You’ll be surprised how much cleaner your kitchen will naturally look with stainless appliances in it. The addition of a rolling island might help add some extra serving and prep-work space to your kitchen, freeing up your counters for small appliances like your favorite mixer, or coffee maker. Studies regularly report the value that landscaping can add to any property. Proper landscaping is a visually enticing addition to any home and can draw potential buyers to your property faster than duller properties. Indeed, some estimates propose that landscaping can increase a properties value by nearly 14 percent. But the values don’t end there, by properly planting shade trees, and shrubbery around the home, a homeowner can make an impact on the micro-climate of the building itself. This means that you’ll see a lower air conditioning bill in the summer, and a lower heating bill in the winter. On top of that is the mental health value of nice landscaping. It’s been shown again and again that being outdoors can have a positive impact on your mental health. If your home has attractive landscaping, you’ll be more likely to spend time outside, and you’ll feel happier and healthier. Even just having a nice view out a window has been shown to minimize feelings of depression and isolation in people. If you’ve just moved into your home, you probably have that “new house” feeling still. The little quirks are endearing because it’s your home. But if you’ve lived in your home for a little while, you might find that leaky faucet that only stops when you turn the handle just right to be a real hassle. Over time, start writing a list of things you want to, and need to, upgrade in your home. By planning out your remodel, you’ll have a holistic strategy for how to approach your home. You’ll be less likely to impulsively put a new bathroom sink in without coordinating it with anything else in there. 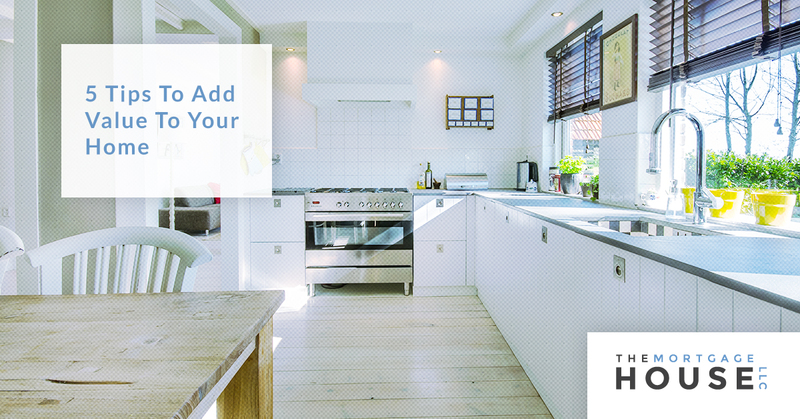 With a list, you can also approach a realtor or home inspector and ask them which upgrades and remodel ideas would net you the greatest return on investment. You might think that knocking out the wall that separates your den from the kitchen is a great idea, but they might encourage you to focus on that broken garage door first. We couldn’t resist adding one more tip to our list. This one is a no-brainer. If you’re in the Fayetteville area, and you’re in need of a mortgage broker, call us today! We’re Fayetteville’s Top Rated Local® mortgage brokers for a reason. With the assistance of a loan officer, we’ll help you navigate the confusing and sometimes difficult process of getting the exact loan to meet your needs. Our team of loan specialists will find you the loan that best meets your needs, and has the best rates, terms, and costs. But our work isn’t over once you’ve got your loan. We provide loan updates and progress reports to ensure that you are always up-to-date on the status of your loan. Our entire process is done online, so there’s no need for you to try and schedule a trip across town for a meeting. So you can apply for loans, shop for alternatives and more, all from the convenience of your own home. Don’t wait. Schedule your free consultation with The Mortgage House, LLC today!